Earplug dispenser offers a hygienic and user-friendly source for hearing protection. Durable plastic design provides an economical choice for dispensing earplugs. Twist-knob provides an easy way to quickly access earplugs. Catch basin prevents earplugs from falling to the ground. Versatile construction can be used on a tabletop or mounted to the wall. 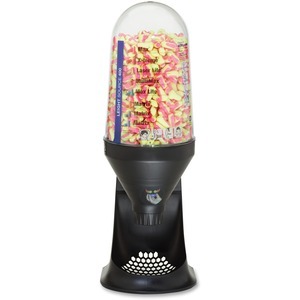 Dispenser holds 400 pairs of Howard Leight Max, Max Lite, Laser Lite, Multi Max or Matrix earplugs (sold separately).